Pantech started shipping model G80 already in December, before official launch of company’s representative office and line-up’s announcement. 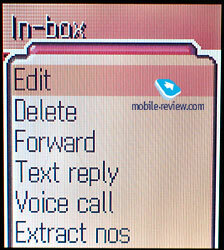 This is the simplest phone in the whole line-up, Pantech considers it being a budget model. The phone’s outlook is very similar to Korean manufacturer’s products, same smooth edges, once again not unique design. This model reminds me of Samsung T100 for some reason, although there are some certain differences in the design. 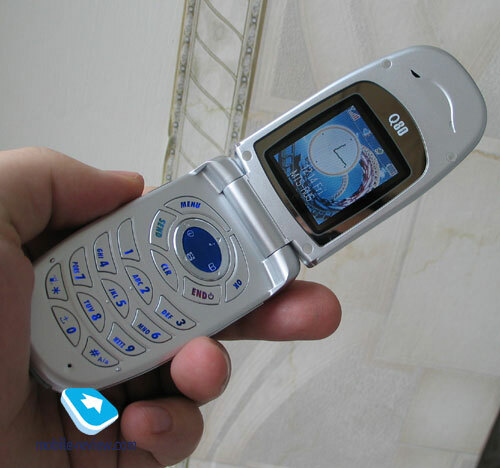 The phone’s size is typical for its segment, same thing can be said about its weight (83.5x46x20 mm, 80 grams). 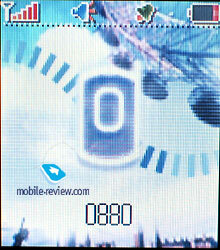 After we open the phone we will see the internal screen which can display up to 65000 colors (SNT). The screen is not big and is related to budget solutions, we can actually repeat the phrase mentioned in the review of Voxtel BD30 – the phone does not set any records in the display quality rate, the picture is slightly pale, not very saturated. 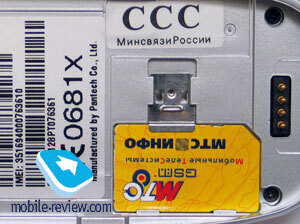 Due to nice appearance of the interface this model looks a lot more interesting, but you have to keep in mind that this is still one of the cheap displays, it can be compared with the one installed in such models as Siemens CX65, Motorola C380, V180, V220. 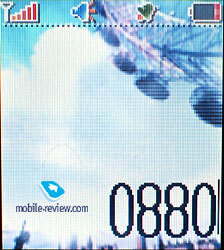 The difference from Voxtel BD30 is that the screen is smaller, this does affect on the way you percept it. 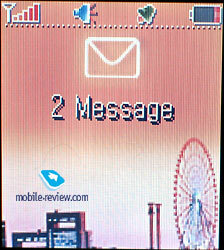 The screen’s resolution is 128x143 pixels, up to 4 text lines and three additional text lines for service needs can be displayed on the screen at once. 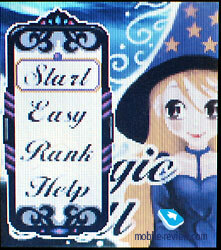 When the screen encounters direct sunlight it turns really pale, the picture is hardly readable. There are two batteries shipped in every package, one of them is slim Lithium Polymer, the other has extended capacity – Lithium-Ion. The slim battery’s capacity is 640 mAh, meanwhile the second one’s is 950 mAh. According to the manufacturer maximal time for the phone’s work in stand by mode is up to 145 hours and up to 2.5 hours during your mobile phone conversations. 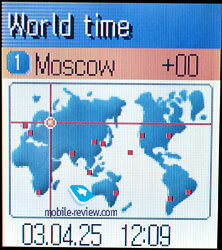 We were testing this model in Moscow, our operator is MTS. 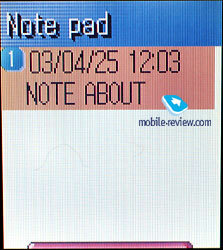 The phone worked for 2.5 days with the second battery, we were talking for about 40 minutes daily and up to 25 minutes were spent for other functions. 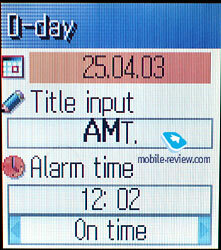 Working time for the first (slim) battery was about 1 day with 20 minutes of talks and minimal use of other functions. It takes about 1.5 hours and 2.5 hours for both batteries to recharge correspondingly. We noticed the fact that battery’s indicator level (especially for the extended capacity battery) is not counted equally and correctly, for example after a long conversation the indicator can show that the battery is almost empty, and after few minutes some additional points may appear. We can see that the manufacturer was trying to point out its unique factor in the interface’s presentation, as a result he had to invent the bicycle for a few times, and step away from the already proven solutions. It is very unusual to press the Menu button in order to access the sub-menu with options in one or other menu item, even though there is no one single solution for this function being present. Red accentuation is comprehended as appearance’s element, but not as hint. You have to look for them with scientific method of clicking everywhere, which is not entirely correct from user’s position. The second slippery moment related to text input, in place of displaying of remaining text symbols the phone is showing percent of text field filling. Of course at first this looks amusing, but later on you understand that the value of such feature is close to zero, the de-facto standard is exactly the number of symbols. And finally the third moment which can be considered as cavils. When you are trying to insert a smiley in the SMS you will see its transformation into common symbols, although it is displayed as picture in the table. Now imagine how this set of symbols should be decoded by a person who received such message, since it is 99% that he does not have a hint which would be a Pantech phone. I will not tell you about such things in details, just for the record: manufacturer’s try of creating unique parts of the product has finally put cross on interface’s capability with phones from other manufacturers. 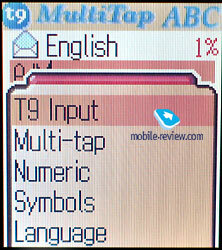 This means that any user who is familiar with other phones will be forced to spend some time for researching G80, the menu is not instinctively. Phone book. 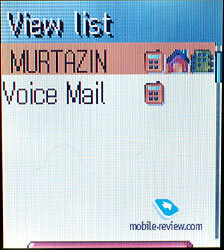 In the phone’s memory one entry can contain three names. The overall amount of entries cannot exceed 200 (numbers, not names). The text length in the Name field cannot exceed 18 symbols. Each name can be assigned to one of the 7 contact groups. For separate record you can choose your custom ring tone, same thing can be done for group, which can be powered with custom LED backlight color. 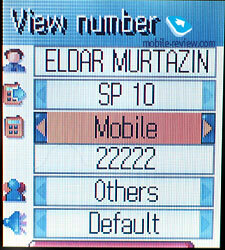 Both numbers from the phone book as well as from SIM-card can be displayed in the list. 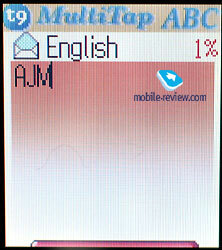 With our SIM-card the phone for some reason was working incorrectly, the entries were displayed as strokes instead of letters. 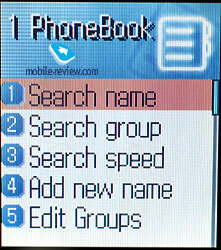 Meanwhile phone book entries were displayed normally. 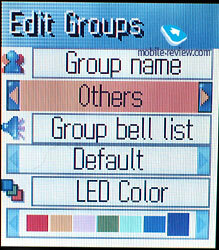 The list supports search by first letter, you can search via groups as well. 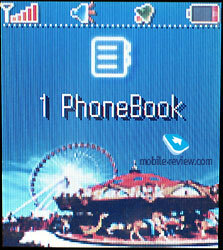 On the whole phonebook’s possibilities are common, nothing special. Messages. 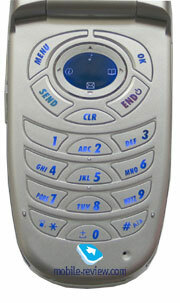 The user can write simple SMS, nothing else is offered. There is no support of EMS, or Nokia Smart Messaging. Sound. The phone’s profiles allow switching between the profiles quickly. Besides choosing the volume level and ring tone’s type (mixed, ring tone, vibrating alert or light only), the phone allows you to choose speaker’s volume during the talk. An interesting peculiarity, considering the high volume and unwillingness of many for their conversation being heard by others. Accessories. 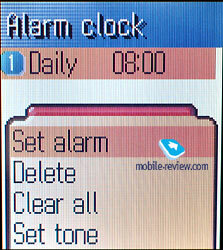 The alarm clock can be setup for single and daily, weekly and monthly activation. 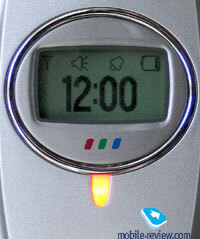 You can also define time intervals during which the alarm will work (10, 20, 30, 60 minutes). 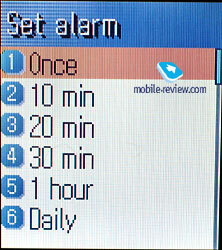 This is convenient in case you are sure that one alarm will not be enough for you to wake up. D-Day is a kind of reminder, you can setup alarm for any of the appointments, almost full copy of events from the calendar, duplication of same function is not pretty clear. 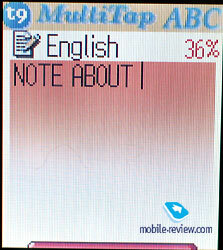 The calculator is convenient, notepad allows saving small text notes. 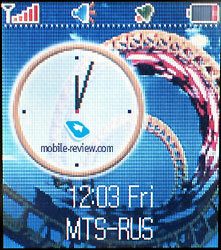 The world time function works, just like it should. 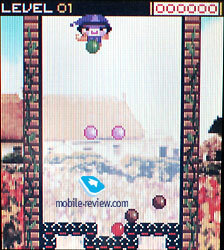 The phone has three games to offer – Magic Ball, Penky, Ghost. 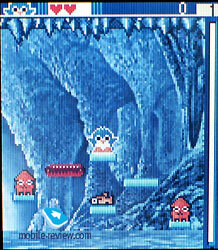 In the first game you have to match the falling balls, some kind of Tetris. The second game – you are playing the role of penguin, who has to jump at the flying desks. 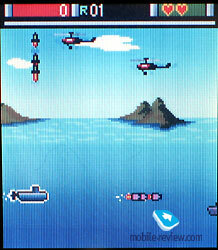 In the last game you have to fight from aviation, submarines of the enemy, nothing special. Settings. The menu hides phone settings beneath, as well as various display settings. Everything is common. WAP. 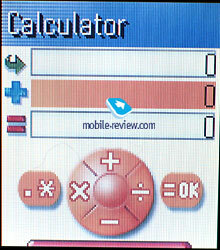 The phone has WAP-browser v1.2.1 installed, GPRS is not supported. The phone provides acceptable connection quality, it can be compared with the one of Asian manufacturers who are outside the big Top 3 of manufacturers. 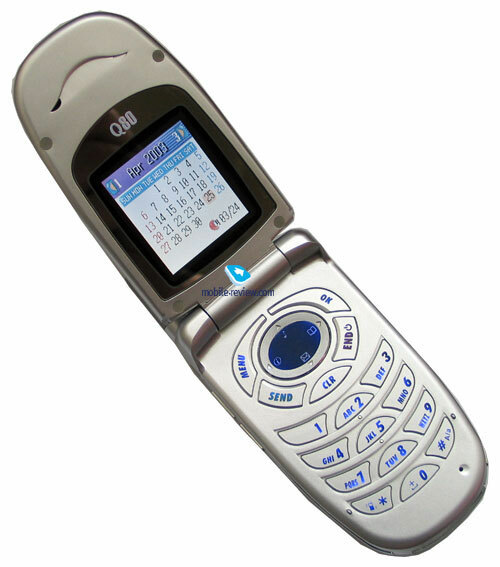 The phone G80 has loud polyphonic ring tones on board (40 chords), it is not very melodic. 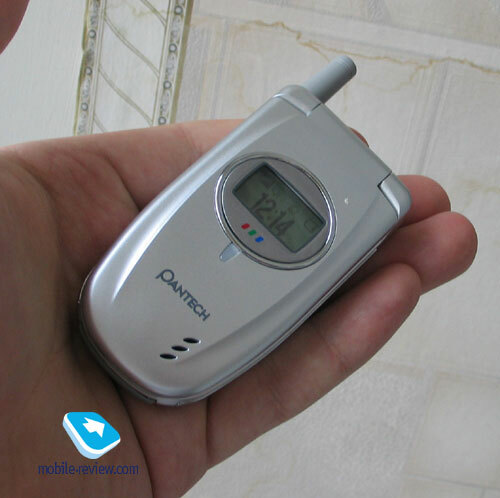 There are 40 ring tones preinstalled, there are even some voices, who were specially made for Russian manufacturers, although they do not sound the way they were originally thought. The vibrating alert’s power is average, it cannot be felt always. The speech transfer quality is average, there are certain noises present, this can be caused due to network as well though. On the other hand the other phones demonstrated better quality. 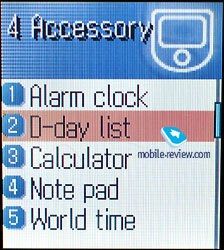 The phone has some problems in the software, the manufacturer’s logic in the interface area is not always clear. If we compare this phone with other products presented on the market, we will come to the conclusion that this is an average model. It does not have appealing or bright outlook (like Voxtel BD30 has for example), The feature set is not rich either, meanwhile the price is rather big. 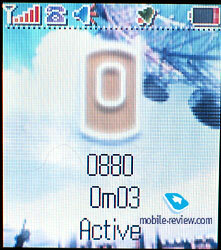 At the moment Pantech Q80 costs around 175 dollars. As a result the phone had already become niche product, it is bought impulsively, under the influence, perhaps advice from the salesman. In our opinion you should not buy G80 for the price which is set at the moment, it does not have any appealing parts. The real price should be set around 140-145 dollars, in this case the phone will look interesting enough considering its lacks.